Answer questions 2 and 3 based on the following information. Let f(x) = ax2 + bx + c, where a, b and c are certain constants and a ≠ 0. It is known that f(5) = -3f(2) and that 3 is a root of f(x) = 0. 3.What is the value of a + b + c? Answer questions 5 and 6 based on the following information. The figure shows the plan of a town. The streets are at right angles to each other. A rectangular park (P) is situated inside the town with a diagonal road running through it. There is also a prohibited region (D) in the town. 7. Let f(x) be a function satisfying f(x) f(y) = f(xy) for all real x, y. If f(2 ) = 4, then what is the value of f(1/2) ? 8. The integers 1, 2…..40 are written on a blackboard. The following operation is then repeated 39 times: In each repetition, any two numbers, say a and b, currently on the blackboard are erased and a new number a + b – 1 is written. What will be the number left on the board at the end? 10. In a triangle ABC, the lengths of the sides AB and AC equal 17.5 cm and 9 cm respectively. Let D be a point on the line segment BC such that AD is perpendicular to BC. If AD = 3 cm, then what is the radius (in cm) of the circle circumscribing the triangle ABC? 11. What are the last two digits of 72008? 12. If the roots of the equation x3– ax2 + bx – c = 0 are three consecutive integers, then what is the smallest possible value of b? 13. Consider obtuse-angled triangles with sides 8 cm, 15 cm and x cm. If x is an integer, then how many such triangles exist? 14. How many integers, greater than 999 but not greater than 4000, can be formed with the digits 0, 1, 2, 3 and 4, if repetition of digits is allowed? 15. What is the number of distinct terms in the expansion of (a + b + c)20? 16. Consider a square ABCD with midpoints E, F, G, H of AB, BC, CD and DA respectively. Let L denote the line passing through F and H. Consider points P and Q, on L and inside ABCD, such that the angles APD and BQC both equal 120°. 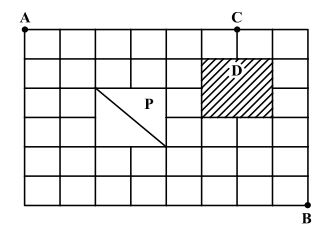 What is the ratio of the area of ABQCDP to the remaining area inside ABCD? 17. Three consecutive positive integers are raised to the first, second and third powers respectively and then added. The sum so obtained is a perfect square whose square root equals the total of the three original integers. Which of the following best describes the minimum, say m, of these three integers? 19. Two circles, both of radii 1 cm, intersect such that the circumference of each one passes through the center of the circle of the other. What is the area (in sq cm) of the intersecting region? 20. Rahim plans to drive from city A to station C, at the speed of 70 km per hour, to catch a train arriving there from B. He must reach C at least 15 minutes before the arrival of the train. The train leaves B, located 500 km south of A, at 8:00 am and travels at a speed of 50 km per hour. It is known that C is located between west and northwest of B, with BC at 60° to AB. Also, C is located between south and southwest of A with AC at 30° to AB. The latest time by which Rahim must leave A and still catch the train is closest to. 21. Consider a right circular cone of base radius 4 cm and height 10 cm. A cylinder is to be placed inside the cone with one of the flat surface resting on the base of the cone. Find the largest possible total surface area (in sq. cm) of the cylinder. Five horses, Red, White, Grey, Black and Spotted participated in a race. As per the rules of the race, the persons betting on the winning horse get four times the bet amount and those betting on the horse that came in second get thrice the bet amount. Moreover, the bet amount is returned to those betting on the horse that came in third, and the rest lose the bet amount. Raju bets Rs. 3000, Rs. 2000 Rs. 1000 on Red, White and Black horses respectively and ends up with no profit and no loss. 22. Which of the following cannot be true? 23. Suppose, in addition, it is known that Grey came in fourth. Then which of the following cannot be true? Each question is followed by two statements, A and B. Mark (1) if the question can be answered by using statement A alone but not by using statement B alone. Mark (2) if the question can be answered by using statement B alone but not by using statement A alone. Mark (3) if the question can be answered by using either of the statements alone. Mark (4) if the question can be answered by using both the statements together but not by either of the statements alone. Mark (5) if the question cannot be answered on the basis of the two statements. 1. If the number of players, say n, in any round is even, then the players are grouped into n/2 pairs. The players in each pair play a match against each other and the winner moves on to the next round. 2. If the number of players, say n, in any round is odd, then one of them is given a bye, that is, he automatically moves on to the next round. The remaining (n – 1) players are grouped into (n – 1)/2 pairs. The players in each pair play a match against each other and the winner moves on to the next round. No player gets more than one bye in the entire tournament. 24. What is the number of matches played by the champion? A. The entry list for the tournament consists of 83 players. B. The champion received one bye. 25. If the number of players, say n, in the first round was between 65 and 128, then what is the exact value of n? A. Exactly one player received a bye in the entire tournament. 26. Aditya did not get a call from even a single college. What could be the maximum aggregate marks obtained by him? 27. Bhama got calls from all colleges. What could be the minimum aggregate marks obtained by her? 28. Charlie got calls from two colleges. What could be the minimum marks obtained by him in a section? 29. While the subscription in Europe has been growing steadily towards that of the US, the growth rate in Europe seems to be declining. Which of the following is closest to the percent change in growth rate of 2007 (over 2006) relative to the growth rate of 2005 (over 2004)? 31. In 2003, sixty percent of subscribers in Europe were men. Given that woman subscribers increase at the rate of 10 percent per annum and men at the rate of 5 percent per annum, what is the approximate percentage growth of subscribers between 2003 and 2010 in Europe? The subscription prices are volatile and may change each year. 32. Consider the annual percent change in the gap between subscription revenues in the US and Europe. What is the year in which the absolute value of this change is the highest? 33. There was a mutual transfer of an employee between Marketing and Finance departments and transfer of one employee from Marketing to HR. As a result, the average age of Finance department increased by one year and that of marketing department remained the same. What is the new average age of HR department? 34. What is the approximate percentage change in the average gross pay of the HR department due to transfer of a 40-year old person with basic pay of Rs. 8000 from the Marketing department? 35. If two employees (each with a basic pay of Rs. 6000) are transferred from Maintenance department to HR department and one person (with a basic pay of Rs. 8000) was transferred from Marketing department to HR department, what will be the percentage change in average basic pay of HR department? Abdul, Bikram and Chetan are three professional traders who trade in shares of a company XYZ Ltd. Abdul follows the strategy of buying at the opening of the day at 10 am and selling the whole lot at the close of the day at 3 pm. Bikram follows the strategy of buying at hourly intervals: 10 am , 11 am, 12 noon, 1 pm and 2 pm, and selling the whole lot at the close of the day. Further, he buys an equal number of shares in each purchase. Chetan follows a similar pattern as Bikram but his strategy is somewhat different. Chetan’s total investment amount is divided equally among his purchases. The profit or loss made by each investor is the difference between the sale value at the close of the day less the investment in purchase. The “return” for each investor is defined as the ratio of the profit or loss to the investment amount expressed as a percentage. 36. On a “boom” day the price of XYZ Ltd. keeps rising throughout the day and peaks at the close of the day. Which trader got the minimum return on that day? 37. On a day of fluctuating market prices, the share price of XYZ Ltd. ends with a gain, i.e., it is higher at the close of the day compared to the opening value. Which trader got the maximum return on that day? 38. Which one of the following statements is always true? iii. There was an increase in share price during the closing hour compared to the price at 2 pm. 39. Which of the following is necessarily false? 40. Share price was at its highest at Note: Use data from the previous question. 1. There are three houses on each side of the road. 2. These six houses are labelled as P, Q, R, S, T and U. 3. The houses are of different colours, namely, Red, Blue, Green, Orange, Yellow and White. 4. The houses are of different heights. 5. T, the tallest house, is exactly opposite to the Red coloured house. 6. The shortest house is exactly opposite to the Green coloured house. 7. U, the Orange coloured house, is located between P and S.
8. R, the Yellow coloured house, is exactly opposite to P.
9. Q, the Green coloured house, is exactly opposite to U. 10. P, the White coloured house, is taller than R, but shorter than S and Q. 41. What is the colour of the tallest house? 42. What is the colour of the house diagonally opposite to the Yellow coloured house? 43. Which is the second tallest house? In a sports event, six teams (A, B, C, D, E and F) are competing against each other. Matches are scheduled in two stages. Each team plays three matches in Stage-I and two matches in Stage-II. No team plays against the same team more than once in the event. No ties are permitted in any of the matches. The observations after the completion of Stage-I and Stage-II are as given below. One team won all the three matches. Two teams lost all the matches. D lost to A but won against C and F.
E lost to B but won against C and F.
B lost at least one match. F did not play against the top team of Stage-I. The leader of Stage-I lost the next two matches. Of the two teams at the bottom after Stage-I, one team won both matches, while the other lost both matches. Telecom operators get revenue from transfer of data and voice. 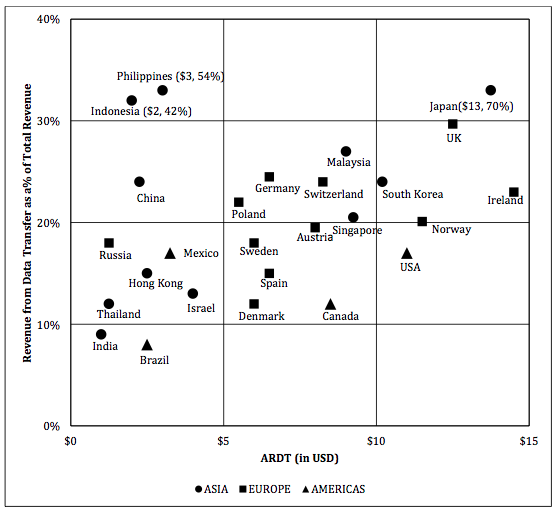 Average revenue received from transfer of each unit of data is known as ARDT. In the diagram below, the revenue received from data transfer as percentage of total revenue received and the ARDT in US Dollars (USD) are given for various countries. 48. If the total revenue received is the same for the pairs of countries listed in the choices below, choose the pair that has approximately the same volume of data transfer. 49. It was found that the volume of data transfer in India is the same as that of Singapore. Then which of the following statements are true? 50. It is expected that by 2010, revenue from the data transfer as a percentage of total revenue will triple for India and double for Sweden. Assume that in 2010, the total revenue in India is twice that of Sweden and that the volume of data transfer is the same in both the countries. 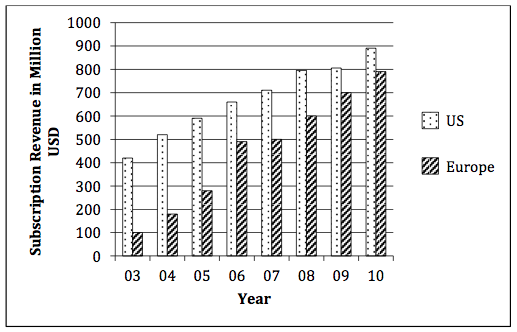 What is the percentage increase of ARDT in India if there is no change in ARDT in Sweden? 51. Anita wore a beautiful broach (A)/brooch(B) on the lapel of her jacket. If you want to complain about the amenities in your neighborhood, please meet your councilor (A)/counselor (B). I would like your advice (A)/advise (B) on which job I should choose. The last scene provided a climactic (A)/climatic (B) ending to the film. Jeans that flair (A)/ flare (B) at the bottom are in fashion these days. 52. The cake had lots of currents (A)/currants (B) and nuts in it. If you engage in such exceptional (A)/exceptionable (B) behavior, I will be forced to punish you. He has the same capacity as an adult to consent (A)/assent (B) to surgical treatment. The minister is obliged (A)/compelled (B) to report regularly to a parliamentary board. His analysis of the situation is far too sanguine (A)/genuine (B). 53. She managed to bite back the ironic (A)/caustic (B) retort on the tip of her tongue. He gave an impassioned and valid (A)/cogent (B) plea for judicial reform. I am not adverse (A)/averse (B) to helping out. The coupe (A)/coup (B) broke away as the train climbed the hill. They heard the bells peeling (A)/pealing (B) far and wide. 54. We were not successful in defusing (A)/diffusing (B) the Guru’s ideas. The students baited (A)/bated (B) the instructor with irrelevant questions. The hoard (A)/horde (B) rushed into the campus. The prisoner’s interment (A)/internment (B) came to an end with his early release. The hockey team could not deal with his unsociable (A)/unsocial (B) tendencies. In each of the following questions there are sentences that form a paragraph. Identify the sentence(s) or part(s) of sentence(s) that is/are correct in terms of grammar and usage (including spelling, punctuation and logical consistency). Then, choose the most appropriate option. B. Nike implemented comprehensive changes in their labor policy.C. E. Although you did make effort to meet me. Each of the following questions has a sentence with two blanks. Given below each question are five pairs of words. Choose the pair that best completes the sentence. 59. The genocides in Bosnia and Rwanda, apart from being mis-described in the most sinister and _______ manner as ‘ethnic cleansing”, were also blamed, in further hand-washing rhetoric, on something dark and interior to _______ and perpetrators alike. 60. As navigators, calendar makers, and other _______ of the night sky accumulated evidence to the contrary, ancient astronomers were forced to _______ that certain bodies might move in circles about points, which in turn moved in circles about the earth. 61.Every human being, after the first few days of his life, is a product of two factors: on the one hand, there is his ________ endowment; and on the other hand, there is the effect of environment, including ________. 62. Exhaustion of natural resources, destruction of individual initiative by governments, control over men’s minds by central ________ of education and propaganda are some of the major evils which appear to be on the increase as a result of the impact of science upon minds suited by _______ to an earlier kind of world. In each of the questions, a word has been used in sentences in five different ways. Choose the option corresponding to the sentence in which the usage of the word is incorrect or inappropriate. (1) I must run fast to catch up with him. (2) Our team scored a goal against the run of play. (3) You can’t run over him like that. (4) The newly released book is enjoying a popular run. (5) This film is a run-of-the-mill production. (1) The police fired a round of tear gas shells. (2) The shop is located round the corner. (3) We took a ride on the merry-go-round. (4) The doctor is on a hospital round. (5) I shall proceed further only after you come round to admitting it. (1) After the long hike our knees were beginning to buckle. (2) The horse suddenly broke into a buckle. (3) The accused did not buckle under police interrogation. (4) Sometimes, an earthquake can make a bridge buckle. (5) People should learn to buckle up as soon as they get into a car. (1) You will find the paper in the file under C.
(2) I need to file an insurance claim. (3) The cadets were marching in a single file. (4) File your nails before you apply nail polish. (5) When the parade was on, a soldier broke the file. Each of the following questions has a paragraph from which the last sentence has been deleted. From the given options, choose the one that completes the paragraph in the most appropriate way. (2) Though ‘Occidentalism’ and ‘orientalism’ as dichotomous concepts have found many adherents. (3) ‘East is East and West is West’ has been a discredited notion for a long time now. (5) The origin of a thought is not the kind of thing to which ‘purity’ happens easily. The passage given below is followed by a set of questions. Choose the most appropriate answer to each question. Language is not a cultural artifact that we learn the way we learn to tell time or how the federal government works. Instead, it is a distinct piece of the biological makeup of our brains. Language is a complex, specialized skill, which develops in the child spontaneously, without conscious effort or formal instruction, is deployed without awareness of its underlying logic, is qualitatively the same in every individual, and is distinct from more general abilities to process information or behave intelligently. For these reasons some cognitive scientists have described language as a psychological faculty, a mental organ, a neural system, and a computational module. But I prefer the admittedly quaint term “instinct.” It conveys the idea that people know how to talk in more or less the sense that spiders know how to spin webs. Web-spinning was not invented by some unsung spider genius and does not depend on having had the right education or on having an aptitude for architecture or the construction trades. Rather, spiders spin spider webs because they have spider brains, which give them the urge to spin and the competence to succeed. Although there are differences between webs and words, I will encourage you to see language in this way, for it helps to make sense of the phenomena we will explore. Thinking of language as an instinct inverts the popular wisdom, especially as it has been passed down in the canon of the humanities and social sciences. Language is no more a cultural invention than is upright posture. It is not a manifestation of a general capacity to use symbols: a three-year-old, we shall see, is a grammatical genius, but is quite incompetent at the visual arts, religious iconography, traffic signs, and the other staples of the semiotics curriculum. Though language is a magnificent ability unique to Homo sapiens among living species, it does not call for sequestering the study of humans from the domain of biology, for a magnificent ability unique to a particular living species is far from unique in the animal kingdom. Some kinds of bats home in on flying insects using Doppler sonar. Some kinds of migratory birds navigate thousands of miles by calibrating the positions of the constellations against the time of day and year. In nature’s talent show, we are simply a species of primate with our own act, a knack for communicating information about who did what to whom by modulating the sounds we make when we exhale. Once you begin to look at language not as the ineffable essence of human uniqueness but as a biological adaption to communicate information, it is no longer as tempting to see language as an insidious shaper of thought, and, we shall see, it is not. Moreover, seeing language as one of nature’s engineering marvels – an organ with “that perfection of structure and co-adaptation which justly excites our admiration,” in Darwin’s words- gives us a new respect for your ordinary Joe and the much-maligned English language (or any language). The complexity of language, from the scientist’s point of view, is part of our biological birthright; it is not something that parents teach their children or something that must be elaborated in school- as Oscar Wilde said, “Education is an admirable thing, but it is well to remember from time to time that nothing that is worth knowing can be taught.” A preschooler’s tacit knowledge of grammar is more sophisticated than the thickest style manual or the most state-of-the-art computer language system, and the same applies to all healthy human beings, even the notorious syntax- fracturing professional athlete and the, you know, like, inarticulate teenage skateboarder. Finally, since language is the product of a well-engineered biological instinct, we shall see that it is not the nutty barrel of monkeys that entertainer-columnists make it out to be. 71. According to the passage, which of the following does not stem from popular wisdom on language? (1) Language is a cultural artifact. (2) Language is a cultural invention. (3) Language is learnt as we grow. (4) Language is unique to Homo sapiens. (5) Language is a psychological faculty. 72. Which of the following can be used to replace the “spiders know how to spin webs” analogy as used by the author? 73. According to the passage, which of the following is unique to human beings? (1) Ability to use symbols while communicating with one another. (2) Ability to communicate with each other through voice modulation. (3) Ability to communicate information to other members of the species. (4) Ability to use sound as means of communication. (1) children instinctively know language. (2) children learn the language on their own. (3) language is not amenable to teaching. (4) children know language better than their teachers or parents. (5) children are born with the knowledge of semiotics. 75. Which of the following best summarizes the passage? (1) Language is unique to Homo sapiens. (2) Language is neither learnt nor taught. (3) Language is not a cultural invention or artifact as it is made out. (4) Language is instinctive ability of human beings. (5) Language is use of symbols unique to human beings. When I was little, children were bought two kinds of ice cream, sold from those white wagons with canopies made of silvery metal: either the two-cent cone or the four-cent ice-cream pie. The two-cent cone was very small, in fact it could fit comfortably into a child’s hand, and it was made by taking the ice cream from its container with a special scoop and piling it on the cone. Granny always suggested I eat only a part of the cone, then throw away the pointed end, because it had been touched by the vendor’s hand (though that was the best part, nice and crunchy, and it was regularly eaten in secret, after a pretense of discarding it). The four-cent pie was made by a special little machine, also silvery, which pressed two disks of sweet biscuit against a cylindrical section of ice cream. First you had to thrust your tongue into the gap between the biscuits until it touched the central nucleus of ice cream; then, gradually, you ate the whole thing, the biscuit surfaces softening as they became soaked in creamy nectar. Granny had no advice to give here: in theory the pies had been touched only by the machine; in practice, the vendor had held them in his hand while giving them to us, but it was impossible to isolate the contaminated area. I was fascinated, however, by some of my peers, whose parents bought them not a four-cent pie but two two-cent cones. These privileged children advanced proudly with one cone in their right hand and one in their left; and expertly moving their head from side to side, they licked first one, then the other. This liturgy seemed to me so sumptuously enviable, that many times I asked to be allowed to celebrate it. In vain. My elders were inflexible: a four-cent ice, yes; but two two-cent ones, absolutely no. Today, citizen and victim of a consumer society, a civilization of excess and waste (which the society of the thirties was not), I realize that those dear and now departed elders were right. Two two-cent cones instead of one at four cents did not signify squandering, economically speaking, but symbolically they surely did. It was for this precise reason that I yearned for them: because two ice creams suggested excess. And this was precisely why they were denied me: because they looked indecent, an insult to poverty, a display of fictitious privilege, a boast of wealth. Only spoiled children ate two cones at once, those children who in fairy tales were rightly punished, as Pinocchio was when he rejected the skin and the stalk. And parents who encouraged this weakness, appropriate to little parvenus, were bringing up their children in the foolish theatre of “I’d like to but I can’t.” They were preparing them to turn up at tourist-class check-in with a fake Gucci bag bought from a street peddler on the beach at Rimini. Nowadays the moralist risks seeming at odds with morality, in a world where the consumer civilization now wants even adults to be spoiled, and promises them always something more, from the wristwatch in the box of detergent to the bonus bangle sheathed, with the magazine it accompanies, in a plastic envelope. Like the parents of those ambidextrous gluttons I so envied, the consumer civilization pretends to give more, but actually gives, for four cents, what is worth four cents. You will throw away the old transistor radio to purchase the new one, that boasts an alarm clock as well, but some inexplicable defect in the mechanism will guarantee that the radio lasts only a year. The new cheap car will have leather seats, double side mirrors adjustable from inside, and a paneled dashboard, but it will not last nearly so long as the glorious old Fiat 500, which, even when it broke down, could be started again with a kick. The morality of the old days made Spartans of us all, while today’s morality wants all of us to be Sybarites. 76. Which of the following cannot be inferred from the passage? (1) Today’s society is more extravagant than the society of the 1930s. (2) The act of eating two ice cream cones is akin to a ceremonial process. (3) Elders rightly suggested that a boy turning eyes from one cone to the other was more likely to fall. (4) Despite seeming to promise more, the consumer civilization gives away exactly what the thing is worth. (5) The consumer civilization attempts to spoil children and adults alike. (1) it made dietetic sense. (3) it was more fun. (4) it had a visual appeal. (5) he was a glutton. 79. What does the author mean by “nowadays the moralist risks seeming at odds with morality”? (1) The moralists of yesterday have become immoral today. (2) The concept of morality has changed over the years. (4) The risks associated with immorality have gone up. (5) The purist’s view of morality is fast becoming popular. A remarkable aspect of art of the present century is the range of concepts and ideologies which it embodies. It is almost tempting to see a pattern emerging within the art field- or alternatively imposed upon it a posteriori- similar to that which exists under the umbrella of science where the general term covers a whole range of separate, though interconnecting, activities. Any parallelism is however- in this instance at least- misleading. A scientific discipline develops systematically once its bare tenets have been established, named and categorized as conventions. Many of the concepts of modern art, by contrast, have resulted from the almost accidental meetings of groups of talented individuals at certain times and certain places. The ideas generated by these chance meetings had twofold consequences. Firstly, a corpus of work would be produced which, in great part, remains as a concrete record of the events. Secondly, the ideas would themselves be disseminated through many different channels of communication- seeds that often bore fruit in contexts far removed from their generation. Not all movements were exclusively concerned with innovation. Surrealism, for instance, claimed to embody a kind of insight which can be present in the art of any period. This claim has been generally accepted so that a sixteenth century painting by Spranger or a mysterious photograph by Atget can legitimately be discussed in surrealist terms. Briefly, then, the concepts of modern art are of many different (often fundamentally different) kinds and resulted from the exposures of painters, sculptors and thinkers to the more complex phenomena of the twentieth century, including our ever increasing knowledge of the thought and products of earlier centuries. Different groups of artists would collaborate in trying to make sense of rapidly changing world of visual and spiritual experience. We should hardly be surprised if no one group succeeded completely, but achievements, though relative, have been considerable. Landmarks have been established – concrete statements of position which give a pattern to a situation which could easily have degenerated into total chaos. Beyond this, new language tools have been created for those who follow- semantic systems which can provide a springboard for further explorations. The codifying of art is often criticized. Certainly one can understand that artists are wary of being pigeon-holed since they are apt to think of themselves as individuals- sometimes with good reason. The notion of self-expression, however, no longer carries quite the weight it once did; objectivity has its defenders. There is good reason to accept the ideas codified by artists and critics, over the past sixty years or so, as having attained the status of independent existence- an independence which is not without its own value. The time factor is important here. As an art movement slips into temporal perspective, it ceases to be a living organism- becoming, rather, a fossil. This is not to say it becomes useless or uninteresting. Just as a scientist can reconstruct the life of a prehistoric environment from the messages codified into the structure of a fossil, so can an artist decipher whole webs of intellectual and creative possibility from the recorded structure of a ‘dead’ art movement. The artist can match the creative patterns crystallized into this structure against the potentials and possibilities of his own time. AS T.S Eliot observed, no one starts anything from scratch; however consciously you may try to live in the present, you are still involved with a nexus of behavior patterns bequeathed from the past. The original and creative person is not someone who ignores these patterns, but someone who is able to translate and develop them so that they conform more exactly to his- and our- present needs. (1) ideas generated from planned deliberations between artists, painters and thinkers. (2) the dissemination of ideas through the state and its organizations. (3) accidental interactions among people blessed with creative muse. (4) patronage by the rich and powerful that supported art. (5) systematic investigation, codification and conventions. (1) an art movement that has ceased to remain interesting or useful. (2) an analogy from the physical world to indicate a historic art movement. (3) an analogy from the physical world to indicate the barrenness of artistic creations in the past. (4) an embedded codification of pre-historic life. (5) an analogy from the physical world to indicate the passing of an era associated with an art movement. 83. In the passage, which of the following similarities between science and art may lead to erroneous conclusions? (1) Both, in general, include a gamut of distinct but interconnecting activities. (2) Both have movements not necessarily concerned with innovation. (3) Both depend on collaborations between talented individuals. (4) Both involve abstract thought and dissemination of ideas. (5) Both reflect complex priorities of the modern world. (1) the existence of movements such as surrealism. (2) landmarks which give a pattern to the art history of the twentieth century. (3) new language tools which can be used for further explorations into new areas. (4) the fast changing world of perceptual and transcendental understanding. (5) the quick exchange of ideas and concepts enabled by efficient technology. (1) creative processes are not ‘original’ because they always borrow from the past. (2) we always carry forward the legacy of the past. (3) past behaviors and thought processes recreate themselves in the present and get labeled as ‘original’ or ‘creative’. (4) ‘originality’ can only thrive in a ‘greenhouse’ insulated from the past biases. (5) ‘innovations’ and ‘original thinking’ interpret and develop on past thoughts to suit contemporary needs. The passage given below is followed by a set of five questions. Choose the most appropriate answer to each question. To summarize the Classic Maya collapse, we can tentatively identify five strands. I acknowledge, however, that Maya archaeologists still disagree vigorously among themselves- in part, because the different strands evidently varied in importance among different parts of the Maya realm; because detailed archaeological studies are available for only some Maya sites; and because it remains puzzling why most of the Maya heartland remained nearly empty of population and failed to recover after the collapse and after re-growth of forests. With those caveats, it appears to me that one strand consisted of population growth outstripping available resources: a dilemma similar to the one foreseen by Thomas Malthus in 1798 and being played out today in Rwanda, Haiti, and elsewhere. As the archaeologist David Webster succinctly puts it, “Too many farmers grew too many crops on too much of landscape.” Compounding that mismatch between population and resources was the second strand: the effects of deforestation and hillside erosion, which caused a decrease in the amount of useable farmland at a time when more rather than less farmland was needed, and possibly exacerbated by an anthropogenic drought resulting from deforestation, by soil nutrient depletion and other soil problems, and by the struggle to prevent bracken ferns from overrunning the fields. The third strand consisted of increased fighting, as more and more people fought over fewer resources. Maya warfare, already endemic, peaked just before the collapse. That is not surprising when one reflects that at least five million people, perhaps many more, were crammed into an area smaller than the US state of Colorado (104,000 square miles). That warfare would have decreased further the amount of land available for agriculture, by creating no-man’s lands between principalities where it was now unsafe to farm. Bringing matters to a head was the strand of climate change. The drought at the time of the Classic collapse was not the first drought that the Maya had lived through, but it was the most severe. At the time of previous droughts, there were still uninhabited parts of the Maya landscape, and people at a site affected by drought could save themselves by moving to another site. However, by the time of the Classic collapse the landscape was now full, there was no useful unoccupied land in the vicinity on which to begin anew, and the whole population could not be accommodated in the few areas that continued to have reliable water supplies. Finally, while we still have some other past societies to consider in this book before we switch our attention to the modern world, we must already be struck by some parallels between the Maya and the past societies. As on Mangareva, the Maya environmental and population problems led to increasing warfare and civil strife. Similarly, on Easter Island and at Chaco Canyon, the Maya peak population numbers were followed swiftly by political and social collapse. Paralleling the eventual extension of agriculture from Easter Island’s coastal lowlands to its uplands, and from the Mimbres floodplain to the hills, Copan’s inhabitants also expanded from the floodplain to the more fragile hill slopes, leaving them with a larger population to feed when the agricultural boom in the hills went bust. Like Easter Island chiefs erecting ever larger statues, eventually crowned by pukao, and like Anasazi elite treating themselves to necklaces of 2,000 turquoise beads, Maya kings sought to outdo each other with more and more impressive temples, covered with thicker and thicker plaster- reminiscent in turn of the extravagant conspicuous consumption by modern American CEOs. The passivity of Easter chiefs and Maya kings in the face of the real big threats to their societies completes our list of disquieting parallels. (1) Various ethnic groups competing for land and other resources. (2) Various ethnic groups competing for limited land resources. (3) Various ethnic groups fighting with each other. (4) Various ethnic groups competing for political power. (5) Various ethnic groups fighting for their identity. (2) a drought caused due to deforestation. (1) the Maya kings continued to be extravagant when common people were suffering. (4) It has not been possible to ascertain which of the factors best explains as to why the Maya civilization collapsed.